Orange Blue Terminals and the international wind turbine manufacturer Senvion have signed a contract for the planning, transport, storage and pre-assembly of the wind turbine components for Trianel Windpark Borkum II. This means that the entire above-water part of the wind turbines is to be supplied from Eemshaven and that Eemshaven will once again serve as a base port for a large offshore wind project. This involves the construction of 32 Senvion wind turbines, consisting of rotor blades with a length of approximately 75 metres, 64 tower sections and 32 nacelles. These segments are then transported to Eemshaven, where a large part of the terminal is being set up for storage, logistics operations and assembly. The turbines are of the type 6.2M152 and have a capacity of more than 6 MW. 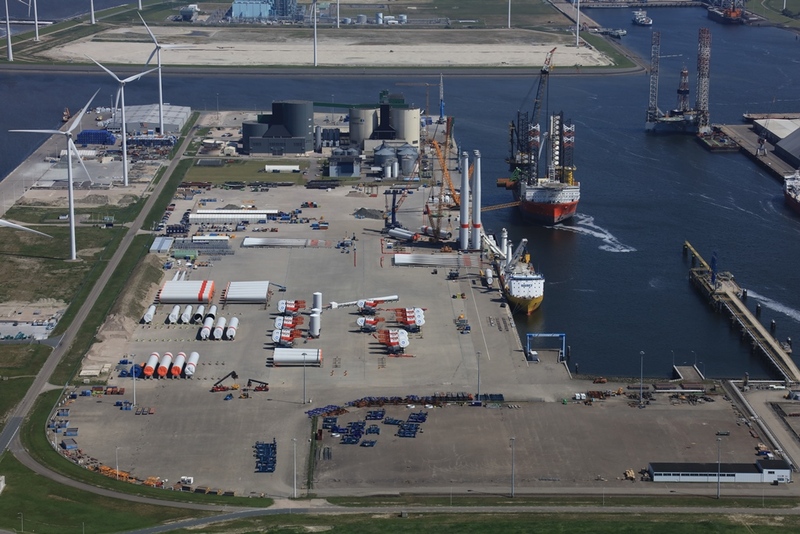 After recently completing the Merkur Offshore wind farm, Orange Blue Terminals is looking forward to working on this new project in the spring of 2019. Another great task and challenge for the company, which now has ample experience in the logistics of offshore wind projects. Planning has already started and is due for completion by the end of this year. Trianel Windpark Borkum II covers an area of approximately 33 square kilometres and is located approximately 45 kilometres north of the German coast. Once operational, the wind farm will supply more than 200 MW of energy. The construction of the wind farm is scheduled to be completed in the autumn of 2019. Trianel Windpark Borkum II is the sixteenth offshore wind project for Eemshaven. Eemshaven also served as the base port for Trianel Windpark Borkum I.